Here you can find a strain description about Avalon 5 reg Next Generation and also some user-based reviews and infos directly from the SeedFinder (if available). You can also find the offers and auctions here if Avalon 5 reg Next Generation cannabis seeds are on stock at MyCannapot right now. Our Avalon was grown and bred in BC for five years now. It can be used indoors and outdoors. Great commercial strain, light green with little hair and extremely resinous. We have selectively bred our Avalon for a versatile I/O strain, it`s now an F4. The plant is stout and fat with stalked resin glands out to the sun leaves. Ready in 6 weeks but will keep getting bigger and bigger if grown longer. 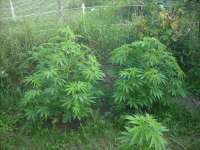 Clones grow about 3-4 ft max indoors, and between 4-5 ft outdoors. Very strong willow-like stalk, huge buds and large yields. Parentage selected outdoors and in greenhouses for three years, with only plants that were adaptable indoors were used for the next round of breeding. Tested indoors in flood tables and soil, on the wet north Island outdoors, and the hot prairies in greenhouses all with amazing results. Avalon 5 reg Next Generation is not available at our shop at the moment!